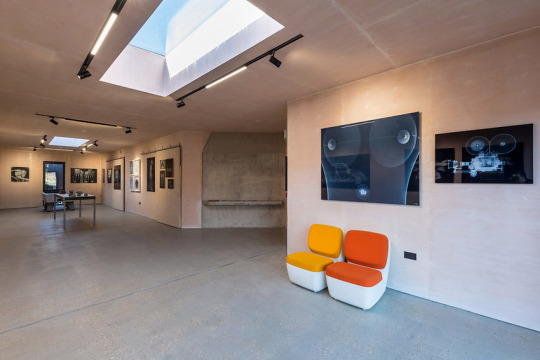 Distinctive works are created using X-Ray equipment, housed in a concrete pyramid chamber, by British photographer Nick Veasey, who has had a studio built and completed by Guy Hollaway Architects. 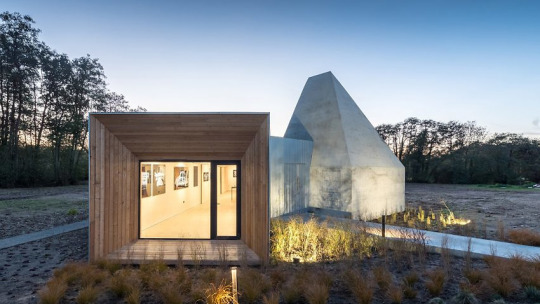 Designed to be an “inquisitive piece of architecture” the Process Gallery, as it is known, stands alone in an open field fringed by woodlands near the village of Lenham in Kent. 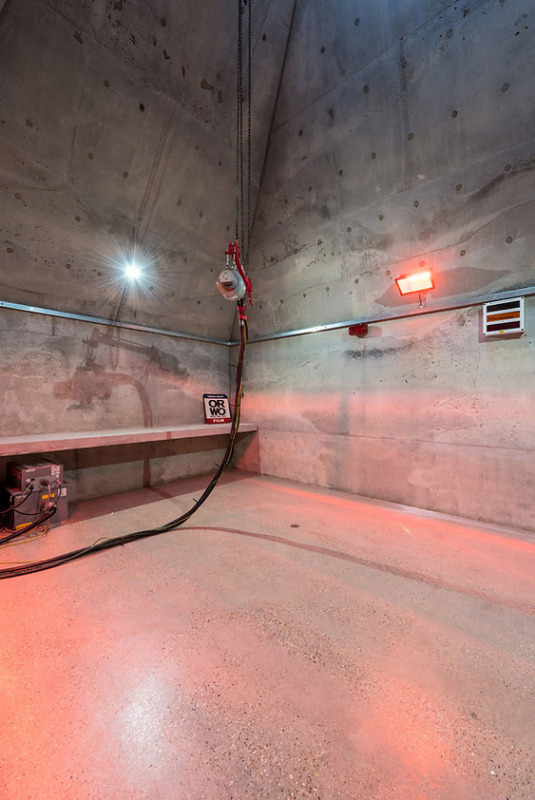 A tall X-Ray chamber which is linked to a small gallery by a heavy metal door and a low volume housing unit featuring a workspace are the elements which comprise the photography studio. By the end of their eventual display from their post-production these X-Ray images that are captured are designed to “expose” Veasey’s artistic process to the general public. An angled wooden reveal piece articulates the exterior, whilst a camera lens -inspired large picture window combine to define the low, corrugated metal -clad gallery volume, to use an architectural phrase. 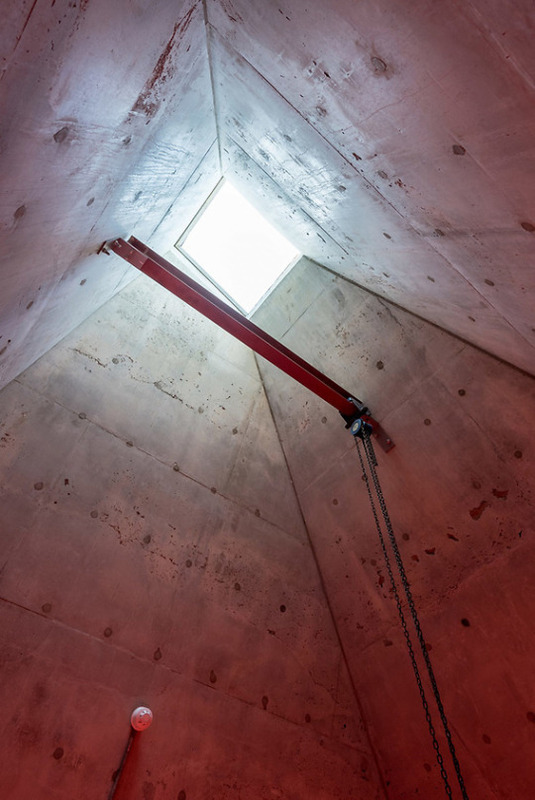 Skylights help to flood the gallery’s simple plywood interior with light. The structure thins out as it rises but at the base had to conform to a 600mm thickness which was a requirement for protection from the gamma rays, all the space’s walls offering sufficient protection; Hollaway architects worked with a specialist X-Ray expert to ensure that health and safety measures were met. The concrete structure has been lent a glossy sheen in places by the smooth formwork of the pouring method of construction which was completed on-site and poured in two days. “It has been designed as a cold space without insulation, so like a cathedral it is cool in the summer and cold in the winter,” said the architects. 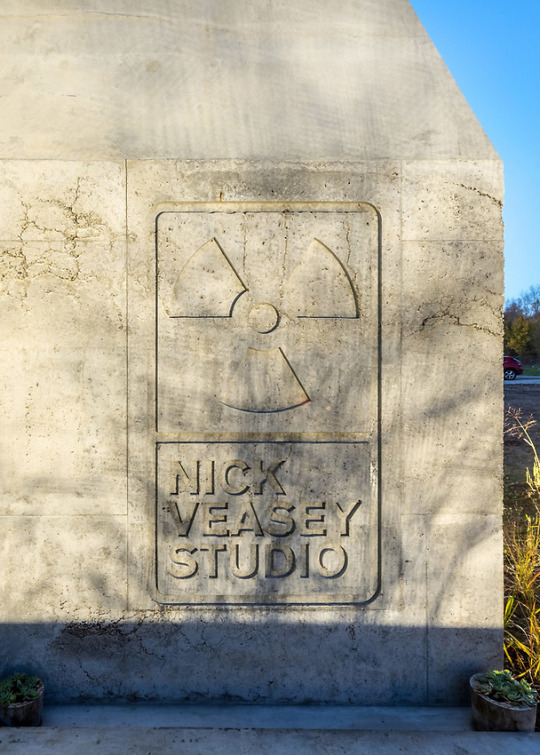 A radioactive symbol, along with the words “Nick Veasey Studio,” are emblazoned on the concrete exterior and at its peak a small skylight window draws light down into the building. In time, Veasey hopes to transform the studio’s surrounding landscape into a sculpture park but until then the impressive Process Gallery is open to the public. This entry was posted in Celebrities, Culture, Exhibition, General interest, Other photographers, Photography, Recent Posts, The Business of Photography and tagged architecture, artist, photography, studio. Bookmark the permalink.